Welcome, Chaneru used over 422,615 times ! Chaneru gives you access to all your photos, music, videos, iPhoto and iTunes. All of your media files can play on your TV and stereo system with their associated album cover artwork. With just a couple of clicks, you can play that video from spring break or slide show of the trip you took last summer on your TV and stereo with the background music of your choice. 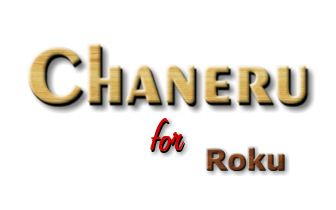 Chaneru is a streaming home media file manager for the Roku network device. It can access content from any computer on your local network or the internet and pass the data through the Roku to your TV and stereo system. With this application it makes the Roku the BEST streaming device out there ! Chaneru provides a client application for Windows ( XP, Vista, Win7 ) and Mac ( OSX 10.5 and 10.6 ) that acts as a web server for your media and is fairly simple to run. Chaneru is also capable of accessing your content contained in iPhoto and iTunes. Please click on "Server" for usage and "Downloads" for the latest server application. There is a built in scanner to detect multiple Roku servers on your network. You can set the starting address and check just scan for ten sequential addresses. It looks for a http network connection and the folder "Roku" in the root directory. The screen will display the status of each result. You can cancel at any time to return to the previous screen. You may have a max of ten devices. With the correct remote software, you can even hook up an iPhone or iPod. Create a "link" in the Roku folder for iPhoto. This link is special in that iPhoto maintains a modified and an original directory for photos. The channel program will check if the photo exists in the modified folder and displays the correct one. This handles the problem where you rotated 50% of them to portrait. The channel program will display all the photos contained in a directory as a slideshow. The show may be paused and the pictures stepped forward and back using the remote "<" ">" keys. You can select music to be played by editing the "Roku_Config.txt" file in the "roku" directory. You can pick a song, artist or album. If you don't use iTunes, you can also insert the file address of a song but it must be relative to the server's base address. Itunes maintains a "iTunes Music Library.XML" file that the Chaneru server or "tables" converts into something that is easier to process for the Roku box. This data is maintained in a folder "iTunes Tables" in the "My Roku" folder or the server's root directory. All the meta data for albums, artist, playlist, podcast and music is contained in this folder. When you first connect to the server, the channel loads all of the information with the exception of track data. The track data is loaded as required which makes it a little more efficient. When you browse to the iTunes folder in the directory title bar, you will see selections for all of the iTunes categories. Internet photos and movies can be referenced by creating a text file with a ".url" extension. You can have multiple links of different types within the ".url" file. You can also substitute "localhost" or "localhost:port" for the domain to access the server running on your computer. You can also assign incrementing counters to control a single link. For example, if you had a link "www.google.com/01/01/2010/1.wmv" with 4 movies per day. You could assign a counter to increment ( 1 to 4 ) for the movies of the day, a second counter to increment through the days ( 1 to 31 ) and a third counter to run the months ( 1 to 12 ). The format is, the link, followed by a tab character followed by a counter in the format min,max,inc. Leading zeros are significant to define the width of the field. The increment defaults to one and may be negative. A max of nine counters is allowed. The link player can be controlled by the "^" for movies and the "v" key for photos on the remote. This allows you to change counters on the fly. Chaneru will display artwork for folders or albums but it must be in a separate image (folder.jpg or cover.jpg) in the same directory as the media. You can specify your own artwork for movies and url links by creating a .jpg image and saving it with the same name as the object in it's directory. The image size should be 214 by 306 pixels for HD or 158 by 204 pixels for SD. The Chaneru channel has a trial period of 30 days. You may purchase it for a one time charge of $10.00 plus processing fee.